From the standpoint of a software developer, we keep following the templates that stay on top of the latest e-commerce trends. So there are some must-have features every free Magento/ Magento 2 themes should include. One of the most important of them is an optimization for mobile devices. This is the keystone of long-term success. Have a look at some tricks to help your website stay ahead in mobile e-commerce. Well, all following templates have a responsive design for the theme's elements. That's something in light of the above. At the end of the post, you will also see the Magento 2 theme that offers much more for mobile users than simply responsive design. Just keep reading. Our first choice fell on the Classic theme. This time-tested template with over 250,000 downloads will be ideally suitable for any kind of store. Classic theme features 10 color presets. Among useful features, you can see featured product slider and new products block with a slider on the homepage. The template is based on 3 column home page layout. Classic theme is easy to customize that helps you to create the online business in a short time. Are you looking the template for a store selling sunglasses, eyeglass, eyewear, optical glasses? SM Glasses theme is a good way to go. This responsive theme is based on the black and white background that makes it look captivating and trendy. The homepage is featured with 2 menu types, social icons, featured products block, the banner with brands. Magento featured products block on the category page brings you more chance to sell much more items throughout the store. ClothesStore template was designed to fit clothes and accessory online stores. Due to modern elegant look, a theme will help you to create an amazing showcase for the apparel, shoes, accessories, etc. You can see a clean 2-column layout with a variety of great effects including animated pictures, parallax scrolling, full-width sliders, and images. This template also provides users with the mega menu that is an important point for overall usability of a website. Grayscale theme follows many good practices for creating stores suitable for selling electronic gadgets, jewelry or accessories. Through the template you can use an admin-side-manageable banner slider on home page, horizontal product/categories menu, newsletter sign-up block, most popular products block, home page products, shopping cart side-bar, customer service block, up-sells and cross-sells. Grayscale theme is available in 5 different styles: Gray, Green, Blue, Red, Orange. Create a memorable first impression for your own website. Meet the easiest way to buy and sell furniture online. Delicate pastel shades of Furnittou theme's color palette has well suited any kind of store selling items of furniture to customers around. The template comes with beautiful grid modern slider. Furnittou template doesn't offer many features. However, this theme will be great for uncomplicated websites that feature a good user interface design. Built on bootstrap 3.x and RWD layout & template, Ves Shoppy is another simple clothing store Magento theme for you. The template features fully responsive design, Sass + Sass fallback structure, ajax add to cart, quick view product, configurable swatches and Google fonts. Ves Shoppy is multilingual & RTL ready. Additionally, the template allows you to use mega menu builder to create a dynamic navigation. Thus you can display the categories in mega menu, vertical menu, mobile menu. The Ideales theme is perfect to build Magento site for architecture, interior/exterior portfolio, home furniture, decoration, home renovation service. In live preview, you can test the view of the template on different screens. So, you will see how your Ideales website will look on smartphones, tablets and desktop screens. Beautiful graphic design and simple functionality will help you to build the user-friendly website. 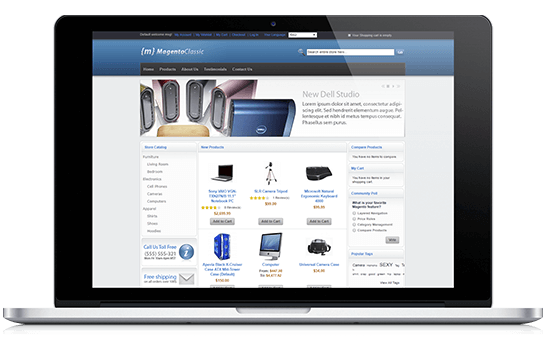 Are you looking for a Magento theme with great widgets built-in? Titany theme was designed to help you showcase traveling goods, clothes, shoes in the best possible way. The template provides 8 widgets included for free. Thus you can show either best sellers or sale-off products directly on a homepage. Responsive for all devices. Among other features, you can see the hover effect over product thumbnail, the product quick-view and ajax add to cart features. Titany also includes a custom Product labels extension. Trex responsive Magento template is a pro designed free Magento sample for the bike and bike accessories web stores. It offers a powerful set of features like a mega menu, product slider, slideshow and off-canvas menu for mobile users. Playing with 5 colors presets, you will deliver highly visual and attractive online presence of your favorite store. Trex is not for cycling industry only. It can be very useful for any other site. View the demo to assure yourself. 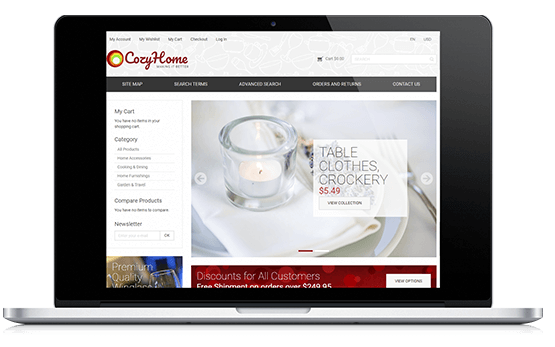 Cozy Home is a classic standard theme that makes it easy to start a business that sells furniture online. This home furniture Magento template is flexible and easy to customize. On the homepage, you can see the new products block, a discount banner and the navigation block displayed on the left. Cozy Home is one of free, high quality, professional Magento themes worth to try out. Start selling shoes with Shoe Store theme and see your business growth shortly after the launch. The Shoe Store is a free responsive Magento theme perfect to sell the shoes, clothes, opticals, fashion products, etc. The template includes an image slider that is a great solution to promote your products. Customers can also use the quick shop and add to cart options to save time and proceed to purchase faster. Would you like to turn your baking passion into a lucrative business? Appetizing design of Ves Bakerop template makes it the best solution for candy shops, bakeries, cafe, and restaurant websites. The theme is prominent with its advanced settings for quick creation of a Magento store. Thus it includes a quickstart package, live theme editor and auto loading custom CSS files. Ves Bakerop is built on bootstrap version 3.0. A responsive framework of this theme is fully adaptive to the most popular screen resolutions. You might have heard about record-holder in Magento downloads. Over 100 000 Magento 1.x Absolute theme installations since template launching! Templates-Master has prepared Magento 2 free Absolute theme. The name tells you what you can expect: the design and usability are absolutely perfect. Two modules are included: Font Awesome and Slick Carousel. Thus you will easily create custom sliders as well as add many awesome visual elements to your web pages. What makes M2 Absolute great is that it is going to be integrated with new simple theme editor soon. Check it out! You can download here. Support is provided via our community forum. This template can be used without copyright link in the footer as it was required in the version for Magento 1. If you’re looking for Magento 2 responsive template with elegant design, you will actually love Ves Need theme. The template is fully optimized for mobile devices, so you can see a friendly off-canvas menu. There are also such features as product list carousel and multiple level drop-down menus. Ves Need is packed with full well-organized PSD source files. Keep customizing your own store using the free template. You are allowed to use this template without author copyright link in the footer. Three-month support is only 65$. Fashion House looks really great as a starting point for your fashion website. The template comes with an elegant and modern design that attracts visitors at first sight. The developers provide you with awesome sliders, featured products block, and informative banners in the footer. Try a demo to see other cool features. Visit the website to learn more about the support fee. Another Magento 2 theme with advanced features is a Pixtron. Whatever your store specializes in, the Pixtron will be great for your website. Fully responsive design, touch-optimized slideshow, off-canvas menu and featured product list options will attract user attention to the products in sites selling mobile, bags, fashion, etc. If you like a professional, clean and classy layouts, a Pixtron template is for you. Combined with a lovely design Ves Kasitoo template provides you with important features for a successful eCommerce business. You can see touch optimized deal products carousel, retina ready images, product tabs carousel and off-canvas menu. There are also social media buttons and featured block on the homepage. Feel free to use this beautiful theme without author copyright link. Among extra charges, you can see 55$ installation fee and 3-month support for 59$. If you're looking for a Magento 2 template designed for an auto store, Bentriz is what you can stick to. This awesome theme also fits perfectly the websites selling auto spare parts, cars, bikes and tools. Contrasting color combination make the template look very appealing. Bentriz theme provides a responsive design, touch slideshow, off-canvas menu. See more details on the theme's page. Despite giving free this vivid template comes with many extra features. Designers offer fullwidth banner, three banners under slideshow, social icons in a footer, payment logos, brands slider and much more. It looks amazing and very helpful. Magento 2 comes with a lot of development possibilities so creators of this template decided to implement them. Have a look! You have to buy Unique license to use a template with your copyright. 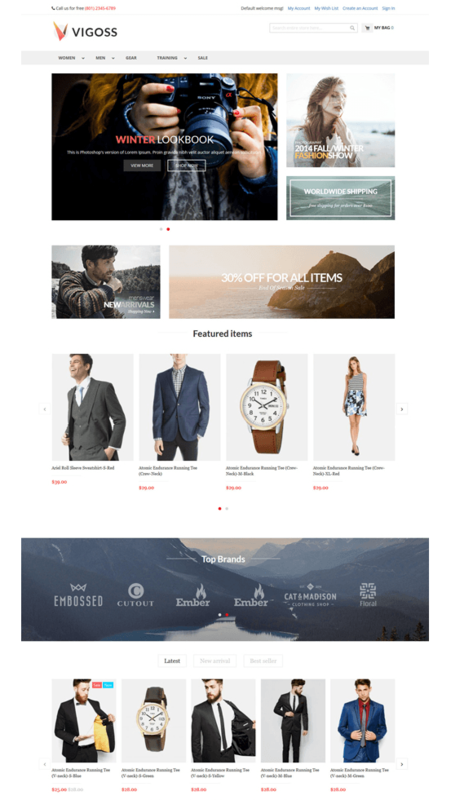 Beautiful minimalist design theme is based on Magento 2.0 blank theme. Now it includes Bootstrap 3.x layout components and lots of nice features like Ajax Cart, Font Awesome, Quickview, Gallery image product detail, Brand logo slider and some checkout process improvements. We suppose you'll like this responsive template nice in case you're looking free Magento 2 theme for fashion, digital or accessories' online store. Look at Free Ves Yume. You may ask yourself “ Why to spend more?” The template is too close to bring stunning shopping experience. Ves Yume is fully responsive that is ultimately increasing mobile sales. It also offers a powerful set of features: off-canvas menu and header link, ajax cart, essential checkout Improvements. In addition you’ ve got a template combined with Bootstrap 3.x layout components. Additional support package can be bought for 3 months and 59$. You are allowed to use this template without author copyright link in the footer. Without the doubt, this template is worth attention. Ves Fasony was built with Bootstrap 3.x that makes template fit all e-commerce stores. Developers highlight a lot of features included: brand carousel, responsive off-canvas mega menu, touch optimised slideshow and improved new products block on the homepage. You can buy support for 3 months and 65$. You are allowed to use this template without author copyright link in the footer. Try out BizKick as a starting point for your online business. The theme starts encouraging customers with a slideshow on the homepage. Other provided features are the following: featured product list, off-canvas menu, auto install demo content. The Bizkick template is rather new, but it comes with 2 paid compatible extensions. So, if you are going to launch a store selling digital and mobile devices, fashion, bags, shoes or accessories, you will like this Magento 2 theme perhaps. This theme has been developed with Magento 2 in mind. It looks nice on every screen resolution. If you’ re going to launch fashion apparel store you may find Ketty much helpful. It&rsquo's streamlined with many features such as custom promotional sliders, images optimised for Retina devices, configurable swatches, ajax shopping cart support. Ketty developers say the template content will run is all browsers without issues. The developer does not provide support services on free templates. You are allowed to use this template without author copyright link in the footer. FreeGo is professionally designed theme for Magento 2 platform. It does a great job when it comes to high usability building. Among features, you can see the blog and brand owl carousel, ready to use static blocks, off-canvas menu, new/featured product list. This template comes with Sold Out and Scroll To Top modules included. Try a demo to see either FreeGo truly triggers an excitement. Technical support will not be available for free version. This template should be used with author copyright link in the footer. Talking about the Luma we see it was dressed for success. It steps ahead of the overall good reputation of previous default Magento theme. Apart from fully responsive design, the Luma comes with all features of the updated platform. Great improvements on the category page and much more you can receive with your Magento. One more Magento 2 free template is the F2 theme. We see it will be perfect for fashion websites. Responsive design will help you be friends with your mobile visitors. The theme comes with advanced options which will make your store look attractive and highly functional. The following features will come in handy: slider, configurable swatches, custom page design, top drop down navigation menu, carousel product listing. F2 is worth adding to your website, indeed. A word on what we promised. Deliver the best user experience on mobile devices with Argento theme. It has an impressive list of awesome designs and Magento 2 extensions in a package. Check out 2 new designs for the Magento 2 Argento: Luxury and Stripes. The template is not free. Nevertheless, we'd like to mention about Argento template because of AMP support. Google Accelerated Mobile Pages will help you to optimize your store for high mobile ranking. For now, you may focus on one of 15 free Magento 2 templates mentioned in our post as well as on 12 templates for previous Magento version. All they are truly worth to be reviewed to keep the leadership in a highly competitive market. However, we hope developers will go on to creating much more free Magento themes. We will monitor progress. Stay with us. Hello Roman, Thank you for including our FreeGo - Magento 2 theme on your list. We are grateful to you. Keep up the good work!! Great collection! I am using Pixtron for my clients website and they like it. It saves development time and cost.